we receive about the benefits of inversion therapy. http://www.energycenter.com/grav_f/anatomy.html#exer and found after doing them for about a week I was symptom free. I use my inversion table regularly and if I feel symptoms of Piriformis Syndrome coming on I do the exercises suggested. The easiest I have found is to go to an office building near where I work and walk 10 flights of stairs once or twice and the results are amazing. I travel internationally and in the past I would often experience symptoms of Piriformis Syndrome when I went on a long flight for example to Australia. It would usually kick in within 1-2 days of landing. Often making my visit terribly uncomfortible. I now use my inversion table regularly, do the exercises and am virtually symptom free. I am a semi-retired Chiropractor and have randomly encouraging patients to use inversion therapy for help with their condition at home. Last summer I had a patient with numerous problems from a MVA (motor vehicle accident), neck to low back along with TBI (Traumatic Brain Injury). His health benefits had run out and he is now on Social Security. In an attempt to help him with some type of home therapy, I suggested he try my older Backswing inversion therapy table. Low and behold it has not only helped his back problems, it has tremendously helped the brain injury. I believe this is due to the increased circulation to the brain. Because of this, and the fact that you have been so overly helpful, I am going to recommend energycenter.com and encourage more patients to buy inversion units. I've been a long-hall trucker for 23 years. I have tried to stay in good shape but no matter what I did my low back pain kept getting worse along with some other health problems. I was at my wits end and stating to get depressed because of the ever increasing pain meds I had to take. One day like a miracle I was parked at a rest stop outside of Dallas when I saw a trucker take an inversion table out of his cab, set it up and hang for about 20 minutes at about a 45 degree angle, then he did about a minute of teeter totter like rocking. I went over and spoke with him and he said without his invesion table he would have to quit trucking. He gave me the number for energycenter.com and I had several very interesting and educational conversations with the people there before I made a purchase. Now when I go on the road I take a Teeter EP-950 with me. I'm almost 280 pounds and this table handles my weight easily. As long as I hang 2-3 times a week my back pain is no longer an issue. The suprising thing is the the other benefits I was not expecting (although one person I spoke with at energycenter.com did mention all kinds of benefits people receive). Along with my back pain I had developed varicose veins and hemorrhoids. After using my table for a few weeks, one day I noticed the veins in my calfs were no longer bulging and after that my hemorrhoid problem has virtually vanished. When I originally spoke with energycenter.com I had mentioned that one thing I notice about my health is that I seem to bruse easier than I did when I was younger. They said you may want to be sure you are getting enough vitamin C with bioflavonoids. Well I did buy some and have been takeing it ever since. My brusing is back to normal and maybe this has helped my veins as well. I wanted to thank you for the service rendered and just using the gravity boots and some herbal supplements, it is amazing I have eliminated about 90% discomfort on either back pain or numbness in my legs and I was due for a 3 level spine surgery last 5th July. I received the boots 4 days before, immediately after trying; I promptly postponed the surgery and happy to have done so. I just have to say that i am so pleased with my teeter table! Thank you so much for your input! I am now at work with no back pain thanks to this table. Words can't describe how happy i am..My girlfriend tried it and is addicted and using it more than I am! I use it before and after work everyday and it really helps me with my pain, posture and balance. This really is the Best Table for the money and i am so happy i found you and purchased this from you. Worth Every Penny! I am also going to take your advise and start climbing some stairs to help my hip adjustment..
At the time I purchased my power inversion table from energycenter.com I could barely walk. Now six months later I have no problem with my back at all. I am so impressed with the results I purchase another table for a friend with a back problem. I am 54 years old and have been wearing a tool belt all my life. I am blessed with a healthy bacl but have still dealt with stiffness especially after a day of building log structures. My wife bought one and I must say it is the best thing she has bought in years. The stiffness in my back is 80% gone and everyday is a good day. We have had it for 4 weeks now and using it 3-4 times a week? will amaze you with the results. Many of my patients have responded dramatically to only short periods of inversion and others with chronic problems, which one would not necessarily expect to improve with any form of therapy, have experienced considerable benefit. It is a simple and logical approach to dealing with the accumulative effects of gravitational stress on the spine. Purchased a Teeter table from energycenter.com in 2007 for my wife's scoliosis condition which cause her much discomfort and time off work. The table has been a God's Sent for both of us. I cannot say enough positive things about the results we have achieved. Our close friend who has also benefitted from the table has purchased it from us. We have now ordered the EP-950 and are looking forward to receiving it. I had an Orthopod for many years. I needed to find another one because my back pain had grown progressively worse. I contacted your company and found out you had been one of the first nationwide dealers of the Orthopod many years ago and were familiar with what I needed. I purchase a DEX II from you and could not be more pleased. It is so much more comfortible and easier to use than the Orthopod. I really appreciate your companies advice and Teeter for making such an excellent pelvic support inversion system. If you need someone for a testimonial please contact me. This EP-950 Inversion Table is an excellent piece of equipment that does as advertised. I actually received multiple benefits since I started inversion therapy about 3 months ago. I'm on my feet a lot and the inversion table has helped my lower back, ankles and knees. I find an angle of around 30 degrees works best for me. It has done exactly what I needed it to do and I'm very pleased. My wife and I are totally pleased with the EP-950 Inversion Table. It was indeed a pleasure to open the package and be pleasantly surprised that everything was even better than we expected. I was impressed with the strength and durability of all components, the attractive finish of all parts and the obvious attention to detail design and execution of how the parts are assembled. The redesigned foot clamping device in the EP-950 was probably the best surprise. It is effortless to use and is functionally far superior to all other models we have tried. We have both now used the table for several days and are already feeling benefits, especially for the lower back. Due to an injury I've had back problems for many years and sciatica for the last six months. The EP-950 I purchased from energycenter.com has already helped relieve the pain after only a week. I'm very very pleased with this inversion equipment. My Inversion Table arrived exactly as advertized and as scheduled. My wife and I assembled it that evening (no big deal) and I've been hanging around since. "DON'T get between me and my table." I first used a Teeter Hang Ups table in Physical Therapy. Nothing in my therapy sessions helped relieve the pain in my back (ruptured disk) as much as the Inversion Table. It made me a believer in Inversion Therapy. After getting the 'Green Light' from my doctor and my surgeon, we ordered an EP-550 for our home. Prior to ordering the table I had questions to direct to your customer service department. They took their time and satisfied all my concerns. I couldn't be more pleased with your product or my dealings with your company. Thanks for delivering a product that lives up to its reputation. I run a small cattle ranch in the Rockey Mountains and spend much of my work week on a horse. Before I started inversion therapy with my Teeter EP-950 inversion table I was seriously thinkink of retiring because of my back pain. Using the table in the morning and evening for about 20-30 minutes has given me a new lease on life. I've had it exactly a year now, and wouldn't want to be without it. The doctors thought by back pain was a result of problems with my gall bladder. After it was removed and I healed up, it was distressing to realize nothing had changed. An MRI showed disc compression and I started using an inversion table and it almost immediatlely helped and I'm now nearly pain free. I personally benefitted from inversion therapy after years of pain. I started using it with my patients and have had excellent results. Even people 80 and 85 years old with spinal stenosis are getting surprisingly good pain relief. Sometimes there is a slight 10-15 degree increase in blood pressure but it is no more than a good sneeze and not cause for concern. After my patients ease into inversion starting with mild angles for a few days or longer I add in mild occilation and the combination of hanging and rocking achieves amazing benefits even for many who have been in pain a long time. The Traction Handles are also a good idea. The Teeter EP-950 Inversion Table I purchased is extremely well built and the welds are impressive. I was a welder for more than 35 years and owned a metal production shop, Magnolia Metal Products. My dad was a welder and I'm nuclear certified and have helped to build nuclear reactors. The quality of the workmanship on this Teeter table is excellent. I would be proud if something of this quality came out of my shop. The welds are fitting of a Class A certified welder. I own a lot of top quality equipment including fitness equipment and this Teeter inversion table really impresses me. I originally tried the EP-550 Inversion Table but the reach down was a little much so I chose the EP-950 and am very satisfied. I have been in several motorcycle accidents and thought my back pain was a result of this trauma. It has been getting so bad recently my doctor recommended an MRI. What was discovered is spinal stenosis. I also have some compressed discs. I purchased a Teeter EP-950 inversion table from energycenter.com and am very glad I did. The 20 degree setting on the safety strap was my first point of relaxation. Within a few days I started to feel hopeful that I might get some relief from the chronic back pain that had come to dominate my every waking hour. After a week I went to the 40 degree setting. I would also use the traction handles to gain additional low back decompression. After about 3 weeks I woke up one morning and realized that my chronic low back pain was greatly diminished. I still had upper low back pain from the stenosis and started doing the oscillation that I read about on your site. Within a few more weeks doing 2 secessions a day for about 20 minutes each and ending with 1-2 minutes of the rocking motion between 40 degrees and full upright my pain had diminished significantly. The occilation movement seems to have a very beneficial effect on the stenosis. I also added the hand held massager therapy as suggested by the person I spoke with in your office. I also spend a few minutes every day doing some of the pelvic muscle balancing exercises I picke up on your website. For the first time in almost a year I can ride my motorcycle without loading up on pain killers. My doctor thought the table might help the compressed discs but held out no hope it would help the stenosis. When I told him it seems to be helping a lot and explained the rocking motion, he said "Well ya, I can see how that might help". I love my inversion table. I've been in discomfort for weeks and weeks. My friend lent me his Teeter inversion table and I used it last night at a mild angle for about 10 minutes. I felt so good on the table and also felt good when I got off the table. I have not been on my feet for more that 15-20 minutes at a time for a while now and today I've been walking around for hours. I feel so happy I finally have some relief. I am a sculptor and do large pieces in various materials. My work is very physically demanding. For two months I had horrendous back pain. I then tried an inversion table and what a miracle. I am purchasing my second DEX II Decompression and Extension System for my second home. The equipment has helped me overcome extreme back pain. I am 74 going on 75 years old and am still quite active. I golf often and workout with weights on a daily basis. A lifetime of power lifting caused disc compression and back pain. The DEX II has reversed this compression and helped me get back to an active life. As a former owner of a Gold's Gym I know good quality equipment when I see it and this Teeter DEX II Decompression and Extension System is very well built and an excellent design. "Olympic Track Star Relies on Her Teeter Inversion Table"
"As an elite sprinter my body has to be prepared to endure very explosive muscular activity. I have found that inversion therapy helps reduce muscle tension and the likelihood of ligament strains. Furthermore, the recovery benefits such as reduced muscle stress, enhanced flexibility and improved blood circulation, have proven helpful in any form of activity, whether it be a World Class race or a casual walk. Although the muscular and ligament benefits have made inversion an integral part of my elite training routine, the posture and circulation effects have further made it a key part of my day. I find myself wanting to exercise just so that I can later enjoy my inversion table." The Teeter Hang Ups is a great product. As a Medical Doctor I recommend it for my patients with back pain and use it myself. It is an excellent alternative to surgery and medication. Early this summer I was hospitalized after being in an auto accident. I sustained a severe whiplash and other injuries. The most painful part of my recovery was the pain in my shoulder, arm and hand from a pinched nerve in my neck. I have been an RN for 40 years and up until the last 25 years or so neck traction was common. I have placed many people in weighted neck and body traction over the years. However, these days most doctors are more oriented towards drugs and surgery. The muscle relaxers and analgesics I was taking in the hospital were not helping me. Ultrasound was not helping. I asked the doctor about traction and he did not believe it would be a good idea. On a whim I laid flat with my head towards the foot of the bed and asked my husband to gently stretch my neck by pulling my head away from my body. When he did this all the pain in my shoulder, arm and hand subsided. I was very excited about this and when I told my doctor he still did not recommend traction but instead doubled my dosage of narcotics. I checked out the next day and my husband purchased an EP-950 Inversion Table from your online store. Using the inversion table 3 times a day for about 15-20 minutes each time I feel I am on the road to a complete recovery. I cannot thank you enough for the excellent information on your site and the assistance I received on the phone when I had a few questions. As I mentioned to the girl in your office the inversion table has also helped me completely reverse a mild case of bladder incontinence. You are very kind and professional, I will reccomend your business to my friends!! I have had my Teeter Hang Ups GL9500 Inversion Table a few months now. Whenever my back gets out of wack I get on the table and get wonderful relief. I was a yoga practitioner and instructor but when I did inverted postures I never got the results I get on the inversion table because I was always in a state of compression. With the table I get the circulatory benefits as well as excellent disc decompression. One benefit I never expected is that my hair has apparently stopped falling out. Before I started inversion I would see visible evidence of my hair falling out every time I took a shower. Now to my great surprise I don't see that any more. Besides all these benefits www.energycenter.com had by far the best price I could find on this excellent inversion table. And by the way I don't usually offer testimonials. The results of using the inversion table were so dramatic I got inspired to share them with you. We purchased the GL9500 for my wife's back problem. It started helping her the first day we used it. Gravity therapy has worked wonders for her. My father has sever back problem and lives on the other side of the county. We are purchasing one for him in the hopes it will offer similar benefits. We believe it will. I'm really enjoying my Teeter GL9500 Inversion Table. My chiropractor has a DRX 9000 and does not believe in using inversion tables. He thinks you need to go to full inversion to get the benefits. I am following the suggestions of energycenter.com and using the table in a very conservative way. I'm going to 35 degrees and the results in only a few weeks have been marvelous. I had fallen backwards down a flight of stairs and injured my back and neck. Using the table with the Massage Mat with Far Infrared Neck Pillow has been really helpful. I am definitely a believer in inversion therapy. Many years ago I was diagnosed with degenerative disc disease. I purchased an inversion table from Energycenter in one of your showrooms in Los Angeles. I believe using the table has helped me to live a quality live and reverse the symptoms that caused my diagnosis. During a recent physical I was pleasantly surprised to find that my height is the same as it has been since I was 19 years old. I was 5' 6" tall then and I am the same now that I am in my late 70s. I have lived in a retirement community for about 20 years and noticed all my friends are shrinking while I am not. In 1982 I discovered the benefits of gravity therapy and have been using my inversion table ever since. Sometimes I only use it 2-3 times a month at about a 35 degree angle. It has consistantly over the years helped with my back pain, circulation, stress and maybe helped me maintain my height. I'm grateful I discovered your company so long ago and to see you are still helping people to relieve their back problems. I received my table yesterday. Put it together last night. Used it five minutes. Slept better than I have in years. Woke up with amazing energy. Nothing short of a miracle. probably caused by several rear end collisions. Thank you for making such a fine piece of equipment. Your inversion equipment is the best on the market, and my patients have benefited greatly from their inversion therapy. Many of my patients purchased your inversion equipment for home use after experiencing the benefits of inversion in my office. Safe, affordable and effective products like yours are what we need in the health profession. I have had amazing results from the Teeter inversion table I purchased from energycenter.com. Last year three orthopedic surgeons said I needed to have back surgery. I had a seriously pinched nerve in my low back. It caused a painful sciatica that burned down my right leg and cause pain all the way to my knee. I could not stand for more that 15 minutes at a time. I spent $7,500 for 32 treatments in my doctors office on a DRX-9000 Spinal Decompression Machine. It was very helpful and reduced my pain by about 80%. I was still in a state of discomfort and had to try something. My inversion table arrived less that a week ago and I am now pain free. I feel the inversion table does everything that the DRX 9000 Spinal Decompression Machine does and more. This is why I am purchasing another inversion table for a friend who has a back problem. 2. Outstanding fit, finish and construction. We received the Teeter EP-950 inversion table and assembled it in 20 minutes. Nothing difficult there. We watched the DVD and it seemed very straightforward. My wife then used the board, and as she was new, she only went to a 60 degree inversion for a total of 4 minutes. The effects felt by the next morning were GREAT. She feels much better already. Her back has been so sore that she has had difficulty getting out of bed and moving, and for the board to fix it to at least a 90% level is really something. I have only been using the inversion table a couple of days, inclining to 20 degrees for about 20 minutes twice a day. Already I am seeing positive results. The first thing I noticed was I could put on my shoes in about 30 seconds, it usually takes me about 5 minutes. I was able to bend over and pick up a piece of paper without holding on to anything for support. I drive a bus all day and usually my legs hurt and I need Motrin. Today I went all day without pain and without taking any drugs. have a good team and it did impresses me. I use the inversion table and the stretch feels fantastic. I am so grateful to have discovered your site. I had been coveting an inversion system for over a decade and fell in love with Hang Ups I had tried on a showroom floor somewhere. This table is the epitome of a well-crafted machine: sturdy, strong, smooth and simple to set up. I can set my F7000 up in about 30 seconds, after I slide it away from where it leans against the wall. I weigh 118 lbs and the table weighs 70 lbs, so I tuck the foam handle under my arm and use the length of the arm to bring the table against my body to shift it and add stability along the vertical meridian. I have no problem moving it smoothly across the berber carpet, though I have to be mindful to do it slowly, so leaning doesn't occur. Every time I set it up, at least once daily, I marvel at its sound construction. The F7000 is the Mercedes Benz of Inversion Tables...and I can say that, I own a classic Mercedes. In addition to the excellence of this machine, I was delighted by your attention to me and my order, your thorough instructions and the completeness of materials I received. Your excellent pricing made this long time dream come true for me and I look forward each day to my blissful "upside down time." Thank you again for your excellence in service and your eye for excellence in products. I would recommend you and this table to anyone. One example of the many testimonials about inversion therapy and cervical spine injuries we have received. During a Brazilian Jujitsu sparing match I herniated a disc in my neck. I had pain, tingling and the doctor said if I did not have immediate surgery I would never regain the strength in my arm. Needless to say I was quite depressed. I was one week away from neck surgery when I discovered inversion therapy. Using the Teeter Hang Ups F7000 inversion table I was able to avoid surgery. I am now 100% recovered and play in three softball leagues in the bay area. It was not only your equipment but also your advice about how to use the inversion table for a cervical problem that was crucial to reversing my cervical disc problem. I started out at about 20 degrees for a couple of days. Then I went to 45 degrees where I spend most of my time. I will relax for about 20 minutes coming up to horizontal 2-3 times during my 20 minute scession. After 20 minutes I feel quite relaxed and decompressed and then I start working to achieve cervical decompression. While hanging at 45 degrees I rotate my head left and right. After a few minute of this relaxing rotation I add aditional head traction. I learned how to do this from the people at energycenter.com. It is so simple but for me it really did the trick. I put the heals of my palms at the the back of my jaw so my thumbs are touching the back of my ears. I then rotate my head left and right again but this time I apply pressure with my hands like I am trying to push my head away from my body. Using my inversion table in conjunction with this simple cervical traction technique decompressed by cervical discs and relieved my pinched nerve. I feel so grateful for the amazing results achieved and not having to have surgery. I thought I would go nuts dealing with the pain of my compressed lumbar discs. The only options the doctosr would recommend were narcotics or surgery. I called energycenter.com because a friend at work bought their inversion table from your store and said you know your business. I had a long conversation with the gentelman there. I was amazed because within a minute or two of explaining my problem he asked if I was on diuretic blood pressure medication. I said I was and he explained that when I said I had bone on bone at the L4 and L5 it was classic for disc dessication secondary to taking water pills. I purchased an EP-950 inversion table and even after only one month I'm seeing results. When I mentioned this to my cardiologist he shook his head and said wow that is something I have never seen in the literature but just might be a contributing factor. I'm almost totally off pain medication and even though I have not had a new MRI I can tell the cushioning is returning and I believe I'm improving week by week. Thank you...I'm so glad I called your comapny. One example of the many testimonials about inversion therapy and scoliosis we have received. product by the way, back pain has diminished greatly with just minutes a day!!! I just want to say that I've been using the F7000 for a couple days now and I can feel the difference already in my back. I ordered the Gravity boots with the F7000 with some uncertainty of whether I would need them, but I'm very glad I did now. With the standard ankle locking mechanism on the F7000 set as recommended on my ankles, after several minutes being inverted my feet seemed to be lacking in circulation, which was immediately relieved when standing upright again, when the ankle mechanism released its pressure. I think that while inverted, the standard ankle locking device placed enough pressure on the arteries in my lower ankle/upper foot to impede circulation. So then I broke out the Gravity Boots and made the modification to the F7000 to accommodate the CV bar over which the boots hook while inverted. The gravity boots made a big difference. I'm having no more issues with impeded circulation and they are just very comfortable while hanging. I only do a 40 degree inversion so far, but it helps very much. I'm not sure if I will ever want to do a total inversion since its not really necessary to obtain the full benefit out of the inversion table. One minor problem I did call customer service about was the fact that the rectangular metal projection on the center of the cross bar on which the sliding main shaft rests was missing the plug that prevents the main shaft from banging on the metal of the cross bar. The customer service rep told me she is sending out a plug to me. Until then I placed some protective felt to eliminate the metal to metal contact. Just a minor quality control issue it seems. Everything else seems to be of excellent quality. I was very impressed with the speed of delivery also. The complementary LED flashlight also is quite nice to have. So this is my impression so far of the Teeter F7000. Just want you to know that we absolutely LOVE our Teeter GL9500! Couldn't be more pleased with it. Thank you for the great service. If you were an e-Bay store I would give positive feedback!! We've only been using our inversion table for a few days and love it. After about four days of inversion, I had to lower my car seat a bit because my head had gotten too close to the roof of the car! I shoveled snow the other day and had the least pain doing this task in 25 years. I just wish I had the machine at my office so I could do a couple of stretches during the day! It was also a pleasure dealing with you and your company. Your pricing was fair, your deliver exceptionally prompt, and all the information you offered gave us a running (or lying?) start on using the machine correctly and effectively. I'd recommend you to anyone. I'm 80 years old and in good health. Since I started using the Hang Ups F7000 inversion table my energy has increased dramatically. I have a feeling it has to do with stretching the spine. I haven't felt this good in ages. I've been using the inversion table for over a month now. It is great to feel peppy again. I love my inversion table. My massage therapist recommended I give it a try after a series of treatments with massage, acupuncture, chiropractic, epidural spinal injections and physical therapy. I received some relief from these therapies although I was still in a lot of pain and discomfort. I have been consistent in my use of the inversion table and it has brought me much needed relief. P.S. I also share my table with my family. My daughter is a certified personal trainer and two sons one of whom is a state champion wrestler. He fractured his disc l-5 in three places and broke a femur bone last year and he has received relief and good stretching from the inversion table as well. I am now 85 years old, retired from general surgery. Have been using Hang Ups inversion machines with gravity boots for over 10 years. Most days I do sessions that include a lot of exercise. I am amazed at the amount of upper body and abdominal musculature I have developed after the age of 70, more than I ever had before, and I remain in good physical and mental health. The idea of elevating aching feet is not a novel one to me, but with the inversion table it takes on a whole new meaning; I can LITERALLY feel the pains and aches melting away. The inverted position relieves stress from my "compressed" joints and back and improves circulation in my feet (they used to be cold all the time - a classic sign of poor circulation). The first time I used it was the first time in a LONG time that I had a full night sleep, after stretching myself for just a half an hour on the inversion table. I woke up rested and I had NO stiff muscles or joints. Heck, I didn't even need coffee and aspirin that morning!!! In closing, I think the inversion table is a health savior. I strongly urge everyone to buy one. I have had serious back problems for forty years and was unaware of inversion tables until recently. Only two weeks ago, I thought I was going to be disabled, because I could hardly stand and because sitting only made the back pain worse. Now I feel almost normal. The inversion table makes me feel much better. I just can't tell you how much we LOVE our inversion table. My husband is in the military and often spends many days with 80-100 pounds of gear on his back while training and loves to come home and relieve a lot of physical stress on the table. I myself have had back problems for 17 years with crushed discs - had surgery last year and I LOVE the relief I get from the table. I am currently using it in conjunction with an orthopedic surgeon - he is a bit old school and doesn't quite understand the benefits I get from the table. I had tingling and numbing also in my chest skin and in my fingers...it has since disappeared. Not to mention the flexibility increased in my entire spine. Often times I can have a good stretch and don't need the muscle relaxants - it's good for strengthening the ab muscles while I am on the table. I want you to know that I feel completely confident that we made the best choice in choosing this table over the competitors. The ankle clamps are extremely comfortable and the structural integrity of the table is light, convenient and comfortable while making the bed feel sturdy and the balance is great. I can't say enough about how great it is. I am a stay home mom and use it everyday several times. Pass the good word along that you have a great quality product and it was a pleasure doing business with you. P.S. Feel free to use this as a true testimonial. My mother has a slant board and gets on it every day. 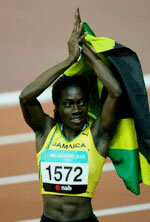 She is in her late 70's and is the picture of health. There must be something to this inversion therapy. You have my permission to use my testimonial anywhere and anytime! I am very pleased also with the friendliness and customer service you have shown. 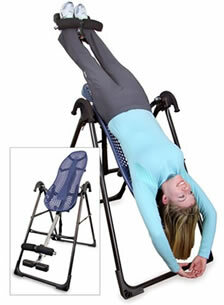 I ordered my Hang Ups Inversion table on Wed., and have just received it Friday only two later. I have been meaning to write to you for a long time to tell you how pleased I am with the results of using the inversion table. At the age of 71 doctors wanted to do a triple laminectomy on my spine. The surgery was to be on L2,3 and 4. I was told the healing process after the surgery would take about six months. I went to another doctor and his opinion was that I would never walk again if I had the surgery. I was in intense pain at the time rated at 10+. After being advised to try an inversion table I called your company and was very pleased with our conservation. I received the table in December of 2002 and have been using it on a regular basis since. I am very happy with the results. I still have some pain but it is quite tolerable compared with the suffering I was going through before I started inversion therapy. Thank you for your excellent product and your assistance. We have our table and was so surprised how fast it got here. Want to THANK YOU SO MUCH. My husband is doing better already!!! I have always enjoyed the one I use to have years ago. So it is great to have a new one. I sure will tell everyone about you. And your friendly service!!! P.S. Also those free bongers are great when I have tightness in my upper back. My wife "bongs" me for about 10 minutes and that helps to loosen up the back muscles. I wanted to let you know that I have had marvelous benefits in the short time of only two weeks I have been using the inversion table. I purchased it for my low back pain which now feels much much better. However, I was very surprised when what we thought was a rotator cuff injury that might require surgery was also benefited by using the table. It must have been a pinched nerve that was relived by the inversion therapy. I am very happy to say I am back to an active life & golfing 4-5 days a week. I don't know if you remember me but, I purchased a F5000 table and boots. We talked on the phone for quite a while and I told you that I would give you a testimonial if it worked. WELL IT DID!!!! IT WORKS!!!! It just makes too much sense not to work. I could hardly function everyday was painful, my sciatic pain was crippling. After 2 weeks I felt wonderful, so I helped a friend to move who is aware of my past back problems and surgery, I did not do much or pick up anything of weight. The next day I hurt very bad, so I continued "hanging" and after a week I was much better. After 2 months now, I feel better than I ever did after my back surgery. I now believe that had I had this inversion table I would have never needed back surgery. The rocking motion seems to work best for me. If you want me tell anyone about my experience have them contact me. I would like to tell you how pleased I am with the results I have received since purchasing the gravity table from you. As we discussed on the phone I have been on permanent disability from my job at Federal Express. Due to the compressed nerves in my back and neck the doctors told me I would never be able to go back to work. The pain and tingling in my arm and hand have been debilitating for nearly two years. I appreciate your advice about checking with my doctor and starting out at a very mild angle. I also appreciate your return policy which allowed me to feel secure in knowing if I did not benefit from the table I could return it. I have excellent news to share with you. After using the table for three weeks I will be starting work again on Monday. The pain and tingling is nearly completely gone and even though I started to receive benefits within two days of using the table I did not think the inversion therapy would help me so much and allow me to return to a normal life again. I have still not even gone to more than 30 degrees. Besides the reduction of my pain I love the stress reducing & relaxing effect it has on me. Ten years ago my brother had spinal fusion surgery. He did receive some reduction of pain but within a year his back problem was worse than before the surgery. He purchased a table from your store in Los Angeles. Recently I also was advised to have spinal fusion surgery. I visited my brother and took his advice and tried his Backswing. He told me he wished he had not had his surgery and had discovered the Backswing many years ago. I tried his table and decided to purchase one for myself. That was six months ago and I must say I do not believe I will require spinal fusion surgery and am extremely happy with the results I have achieved. I appreciate you assisting my brother and I to live a more pain free life. Hanging a few minutes everyday made my back stronger and eventually all the pain disappeared! My back became stronger than it had ever been. I began exercising, including walking and jogging, with no back strains resulting. Today I am 55 years old, my posture is good, and I am healed. The daily inversion stimulated postural and circulatory changes in my body. Better posture was practiced, (standing straighter with thighs tightened and shoulders back). This caused my abdomen to flatten out- no sit-ups or crunches. Other physical changes occurred: My complexion improved and wrinkles and fleshy parts of my face and neck diminished!" When inversion is coupled with posture and toning exercises, internal organs assume their proper position. For example, from left to right, the spleen, stomach, pancreas, liver, and gall bladder are supposed to rest just under the diaphragm and "move" with every breath. When organs are not in their best physiological position, these membranes are compromised, effecting nerve and blood flow. We have found significant improvement using various inversion techniques which needs further exploration. However, we are very excited about the results thus far. After two weeks on the inversion table on a daily basis urinary incontinence disappeared in two female patients. We have used the inversion table on chronic bronchitis as well as asthmatics. I have been using your inversion products in my chiropractic office for the past 14 years. Your inversion equipment is the best on the market, and my patients have benefited greatly from their inversion therapy. After using Hang Ups Inversion Equipment , I have noticed an amazing change in my flexibility, after only a few weeks of use. My golf game is much improved due to greater shoulder mobility. I whole-heartedly attest to the benefits of this product. With the F5000III I noticed a remarkable improvement in my posture and my walk. Before using the inversion table I had muscle spasms and back problems. Inverting daily keeps my body stretched, relaxed, symmetrical. The adult acne that I've had since the age of 29 has nearly disappeared. The cold hands and feet that I have experienced for years has disappeared. In 1982 I started inverting. I was 52 years old then, and over the years I managed to change just about everything; everything from a badly misaligned hip, feet with corns and a walk with a limp to bad tarter on my teeth. Yes, it changed that too! As a long time motorcycle racer with a chronic bad back, I've been very impressed with pain relief I've gotten with the daily use of Hang Ups Inversion Table. It is the best rehabilitation and maintenance device I have ever used. I have found that 100 upside down sit-ups are equal to 1000 regular sit-ups (with less strain on the back). Getting inverted relieves and relaxes not only my joints and vertebrae but lets my organs and blood flow more naturally. Being inverted at least 30 minutes a day improves my performance capability by stimulating my vestibular system and allows decompression of my spine to occur. Professional football places a great deal of stress to the lumbar sacral area of the spine. Inversion assisted stretching is quite beneficial. I would like to report to you that I have had extraordinary success in patients using inversion. Its essential value is the ability of the patient to prevent the onset of a more irreversible symptom complex by having the device available. I've made a lot of purchases for gym accessories, but never have I been as pleased or excited about a product as yours. Thank you for producing a quality product that more people could benefit from if they were aware of its benefits. Thanks again for such a well-made and well-conceived piece of health-giving equipment. From its simplicity and durability, the expertise put into the design of Hang Ups is manifest. I can say in all honesty that your product has markedly improved the quality of my life. I'm enjoying your very well-made machine. After working out I reward myself with lying on the inversion table for a few minutes. When our Inversion table arrived, we were blown away by the obvious quality. This is a well-built piece of equipment. We recommend the inversion table to anyone who will listen. We wouldn't want to be without it every again. All in all, buying and using the table has been a positive experience. Thank you. It was a pleasure to purchase something that didn't take all day to put together and is solidly built to boot. Assembly was a snap! Thanks again. Thanks again for 14 years [now 18] of quality service. Safe, affordable, and effective products like yours are what we need in the health profession. I really have a hard time expressing in words how happy I am that you have engineered your products in the way that you have. Right now, I will settle for thank you, thank you, thank you. I have been using my inversion table for the last 3 weeks. On the first day I started at a 30 degree angle. I have now moved on to a 60 degree angle. I feel great! Let me tell you a little about my health. I suffered 2 herniated discs in my neck from an auto accident about 6 years ago. When it rains and it is damp or during the winter months, I constantly feel pain. I refuse to take any type of mind altering medication or any oral medication at all. I am only able to use the table during to weekend for I am away from home during the week. I use it at least 3 days a week once or twice a day. Here's the good part. When I received the table I set it up as per the instructions. I set it up for a 30 degree angle. I stayed on the table for twenty minutes. I relaxed and then did minor movement. I did feel my back sort of liked crack. As though when you stretch and your bones crack. I find that normal. I moved my neck around and that also cracked. I was scared at first. But I began to feel a relief. When I got off of the table I felt a little dizzy but that is normal and I was not alarmed at all. After moving around I felt so good. My wife also suffered a herniated disc on her lower back. She wouldn't go on the table. But after 3 weeks of just a few days therapy she is very convinced about what it has done for me. She sees it now because I don't complain of the pain anymore. She is starting a therapy secession for herself every day at 30 degrees. In closing I would just like to say, "THANK YOU." And jokingly I told my wife, if ever lost everything I own in my life. The first thing I would invest in is another table. I think the STL inversion equipment is an invaluable tool in back rehabilitation. My physician recommended the use of your inversion table three times daily as part of an active course of physical therapy I noticed results almost immediately. My back injuries have almost completely healed.